London department store Selfridges has announced a series of events to celebrate its 100th birthday. The Oxford Street store opened its doors on 15 March 1909 but centenary events will not start until May. Music, fashion and cabaret performances and an exhibition documenting the history of the shop are among the centenary events planned. 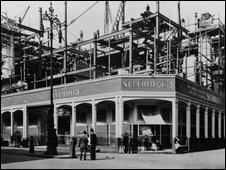 Founded by US entrepreneur Gordon Selfridge, the store attracted 90,000 visitors on its opening day. A group of "Selfridgettes", women dressed in the store's signature yellow, will also make appearances at the shop every Friday and Saturday in May. The shop will organise further events as part of its Yellow Festival every weekend that month.